Park City residents are, all in all, a humble bunch, but we’re well aware that the place we call home is special. Four seasons of exceptional outdoor recreation make that statement absolutely undeniable. When you consider the fact that our historic mining town also happens to serve up award-winning food and drink, it’s no wonder Park City is thought of as a first-rate vacation destination. And, as the host of Sundance Film Festival since 1985, it’s hard to ignore the attention our city gets from film buffs and celebrities. Still, those who wish to be entertained and delighted can look to much more than the slopes and the big screen in Park City. Live performance has long been a centerpiece of our high-mountain culture. We invite you to check out the many theaters and performing arts events happening year-round at unique venues throughout town. Your personal dose of magic might be dispensed by watching the mesmerizing movement of an acclaimed dance company. The human body is truly amazing, isn’t it? Or, if your idea of fun is more cerebral, perhaps a lively discussion about hard-hitting topics will light you up. Consider consuming some food for thought at the Park City Institute Speaker Series or TEDxParkCity events. But don’t blame us for the impassioned debate that ensues between you and your travel companion over post-show snacks. More of a music fan? Prepare for your ears and mind to open. The Eccles Center presents cult favorites and GRAMMY winners from a variety of genres on its main stage, and something on the robust schedule is bound to get your hips swaying and toes tapping. Summertime visitors also rave about two spectacular music series. 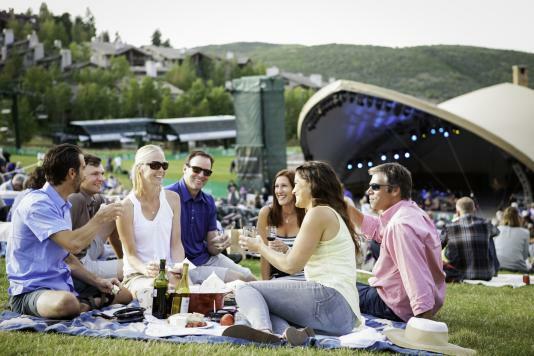 First, the five-week-long Deer Valley Music Festival, which melds the talents of the Utah Symphony and Utah Opera with national touring acts ranging from classic rock and country to show tunes, pop, and jazz. It’s a pairing that proves going to the symphony doesn’t have to be stuffy. The St. Regis Big Stars, Bright Nights concert series at Deer Valley Resort’s outdoor amphitheater is equally fantastic. Attracting both legendary performers and budding artists on their way to superstardom, this summer event offers the best in entertainment coupled with a dazzling backdrop. If you go, don’t forget to pack a picnic basket to the brim. Melodies under a starry sky are that much sweeter with your favorite treats and company. The site of the storied Egyptian Theatre has had several lives. After the original Park City Opera House was destroyed in the fire of 1898, the Dewey Theatre was erected in its place and enjoyed a run until 1916 when the roof collapsed under the weight of a record-breaking snow load. In 1922, construction began on the Egyptian Theatre, and the ornate décor was largely inspired by the discovery of King Tut’s tomb in 1923. You’ll immediately notice the influence when you spot the scarabs, lotus leaf motifs, and hieroglyphics that adorn this magnificent showplace. Whether you opt for a comedy, musical, or theater event, the Egyptian is a must-see landmark during your visit—if not for the performances than for the beauty of the venue alone. It may be true that Park City’s history as a wild silver mining town doesn’t scream sophistication—in fact, it’s a reality we embrace. But you wouldn’t know it from the fine quality of performing arts events. No matter what form moves you—theater, dance, or music—there’s something happening on a Park City stage to suit your specific tastes and make your spirits soar.